Preheat oven to 450°F. In a medium sauce pot bring potatoes, and enough salted water to cover them, to a boil. Reduce heat and cook gently 5-7 minutes until almost tender; drain and set aside. In a small sauce pot bring the carrots, and enough salted water to cover them, to a boil. Reduce heat and cook gently 5 minutes until almost tender; drain and set aside. In a large skillet, heat two tablespoons butter. Add onions and garlic, salt, thyme, sage and pepper. Sauté about 5 minutes. Sprinkle in the flour and then add in the chicken, cooked potatoes & carrots. Stir in the chicken broth and milk. Bring to a boil, reduce heat and simmer to thicken slightly. Add the peas, simmer a few minutes. Meanwhile, place one of the pie crust on the bottom of a round 9″ baking dish. 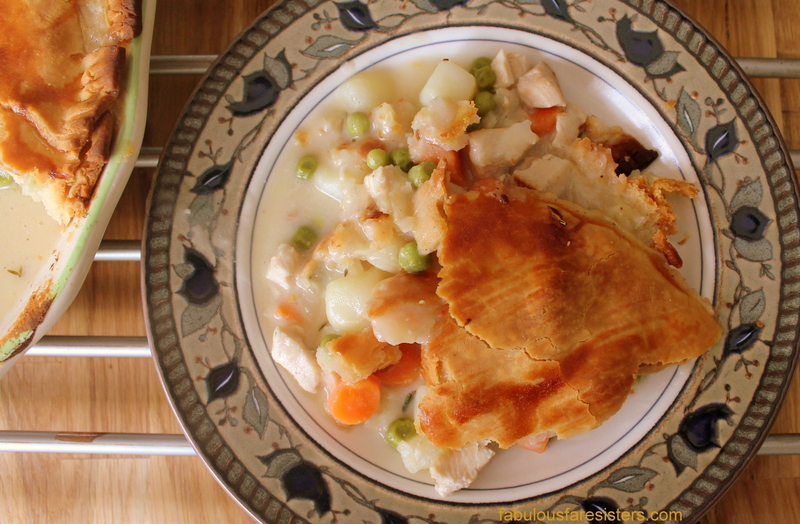 Scoop the chicken mixture into the pie crust and cover with the second pie crust. Crimp the dough around the edge of the baking dish or use a fork to press the pie crust ends together. Brush the top with a little egg white if desired. Bake in the oven for 30 minutes until pie is nicely browned and bubbling. Remove from heat. Cover with aluminum foil and allow to cool for 10 minutes before slicing. Cut a large slice and scoop out all that goodness onto a plate. This chicken pie looks delicious! Great recipe and looks good, I’m going to give it a try! Yum! Looks delicious. Have a great time in NYC. I hope to one day! !